Unique Baby Shower Gifts For Girls: Mothership! Unique baby shower gifts for girls don't come more special or one-of-a-kind than our Captured Wish Mothership for Girls. 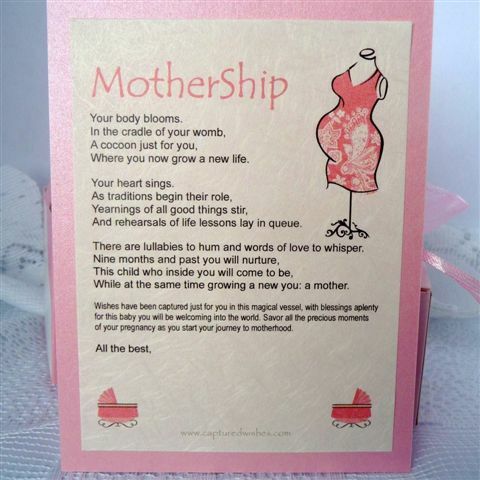 Especially designed to celebrate the imminent arrival of a baby girl, the Wish Vessel comes in perfect custom packaging, is embellished with charms and with a verse card and color key explaining what the colors mean. the birth of a baby, a new baby girl. This vessel holds a representation of the first order of conception, the settling of the egg, the gift of life beginning in the womb, the great introduction to pregnancy. excitement shared with the change of the future. This beautiful Captured Wish (height approx 40mm x 22mm width) is a charming and unique way to bring some joy to the mother-to-be. Filled with lucky fairy dust and decorated with funny and touching charms, each Wish Vessel is unique and one of a kind, just like the Mom! If you're looking for a truly personal baby shower gift idea, then this Captured Wish is the perfect choice. Each one is adorable... just like babies!